Okay, I'll admit it. I'm cheating on this one. Someone's already written about it. What's that you say? You've read every single Forgotten Book blog post, and you don't remember this one? Well, before you go on, click here. Read the post (with which I wholeheartedly agree), and come on back. I'll wait for you. Back so soon? You didn't cheat, did you? If you didn't, you might be scratching your head and thinking I made a mistake. 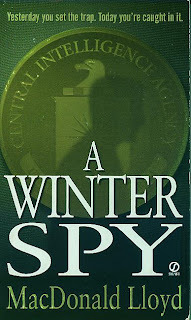 After all, the link takes you to a review of Isle of Joy by Don Winslow, published in England in 1996 by Arrow books, whereas the photo on my blog is of A Winter Spy by MacDonald Lloyd. It was published in the U. S. by Signet Books in 1997. And it's the same book as Isle of Joy, though there's no mention of that title anywhere on the cover or copyright page, just as there's no mention of any previous publication. The copyright page does mention Don Winslow, but this book's not included in the bibliography on his website (Isle of Joy is). I don't know what the deal is, but I thought it was interesting. Maybe you don't, but, after all, it's my blog. Also, it's my excuse for talking about the book. It's the same one, all right, but then again, it's got a different title and author's name. It's also a lot easier to find and a lot cheaper to buy than Isle of Joy. Winslow takes his time in this book, introducing the characters, setting up the situation, and describing New York City. (The book is a love story in more ways than one. But one of them is about Walter Withers' love for the city. Anybody who lived in New York around 1959 should really like this novel.) By the second half of the book, everything comes together in a series of dazzling single, double, and triple crosses. Winslow has so many balls in the air that you wonder how he'll ever manage them, but he does, with the help of a bit of coincidence here and there. Mostly, though, we learn that, as Freud said, there are no accidents. Everything was planned from the start, or at least set in motion. One thing I particularly liked was Withers' occasional reading to the very ill wife of one of his colleagues. The book Withers chooses is One Lonely Night, which is an entirely different sort of Cold War novel, the antithesis of A Winter Spy, and I love this comment: ". . . the G-men . . .had little to do until Mickey Spillane alerted them to the communist menace and Hoover started to do his Michael Palmer impersonation and saw Red spies everywhere." This is the first time I've seen Spillane blamed for the Red Scare, and of course Winslow's kidding. At least a little bit. Why didn't this book sell a ton? I have no idea. Great writing, wonderful characters, loving recreation of a time and a place, a love story, a spy thriller, and more. What do people want, anyway? I know, I know. They want James Patterson, but they're missing a heck of a great read. Repeats are great. It's been too long now to think each one will be new. And most of them deserve more than one mention. Thanks, Bill. Great - another book I need to get. Seriously, I like Winslow too and this sounds good, even if I was 10 (and yes, living in New York) in 1959. Yes, they want James Patterson. And Stephenie Meyer. And other really lousy writers. OK, I ordered it from PaperBackSwap. That's the beauty of having a lot of credit. Okay, I didn't know about this book at all. But since Winslow's The Dawn Patrol was my favorite novel of 2008, I'm not hesitating to find this book. Cold War spies? 1958? Can you say "perfectamundo"? I haven't read this (nor any other Winslow), but could it be that the US publisher was thinking of the pulp/comics character and didn't want anyone to think it was about the same dude? That's a stretch, but it's all I can think of. Was there an earlier US edition? As far as I know, this is the only U. S. edition. Winslow had published earlier books under his own name, so no one was worried about the confusion. Probably only us old geezers (and you) remember Don Winslow of the Navy. Not you, of course, though you're nowhere near Juri's age. I love it when you find these obscure books that have tangled publishing histories! I will definitely pick up A WINTER SPY. I've had a copy of Isle of Joy sitting around for several years. It has a WH Smith sticker on the back cover so I must have picked it up cheaply during a trip to England. I have read The Dawn Patrol and California Fire and Life, his novel about insurance fraud, and liked them both very much. May have to try this one. Okay then, my geezer brain can't think of any other explanation. And what's with that pseudonym: MacDonald Lloyd? Who thinks that's a real person's name? You Say Your Kid Seems Jet-Propelled? 20 All-Time Coolest Heroes in Pop Culture? Turn off the Lights, . .
Monte Hale, R. I. P.